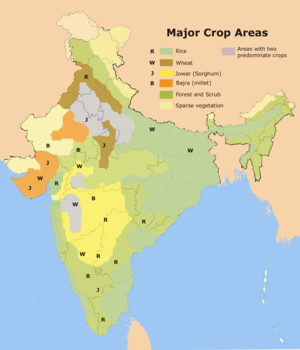 According to the Indian Statistical Report, 2011 , the following are the principal crops of India*. * Absence of data may contribute to all comparisons. Although other crops such as Tea, Coffee, Natural rubber, Tobacco, Potato, Black pepper, Chillies, Ginger, Coconut, Turmeric as mentioned as principal crops in the report, no state-wise information is available for these. The following table presents the twenty most important agricultural produce in India, by economic value, in 2009. Included in the table is the average productivity of India's farms for each produce. For context and comparison, included is the average of the most productive farms in the world and name of country where the most productive farms existed in 2010. The table suggests India has large potential for further accomplishments from productivity increases, in increased agricultural output and agricultural incomes. Although agriculture in India has shown an increase in average agricultural output per hectare in last 60 years, much more needs to be accomplished to reach the top-ranking countries and ensure our food safety. The table below presents average farm productivity in India over three farming years for some crops. Improving road and power generation infrastructure, knowledge gains and reforms has allowed India to increase farm productivity between 40% to 500% over 40 years. India's recent accomplishments in crop yields while being impressive, are still just 30% to 60% of the best crop yields achievable in the farms of developed as well as other developing countries. Additionally, despite these gains in farm productivity, losses after harvest due to poor infrastructure and unorganized retail cause India to experience some of the highest food losses in the world. One study suggests Indian agricultural policy should best focus on improving rural infrastructure primarily in form of irrigation and flood control infrastructure, knowledge transfer in forms of better yielding and more disease resistant seeds with the goal of sustainably producing as many kilograms of food staples per hectare as already produced sustainably in other nations. Additionally, cold storage, hygienic food packaging and efficient modern retail to reduce waste can also dramatically improve India’s agricultural output availability and rural incomes. The average size of land holdings is very small (less than 2 hectares) and is subject to fragmentation due to land ceiling acts, and in some cases, family disputes. Such small holdings are often over-manned, resulting in disguised unemployment and low productivity of labour. Some reports claim smallholder farming may not be cause of poor productivity, since the productivity is higher in China and many developing economies even though China smallholder farmers constitute over 97 percent of its farming population. Chinese smallholder farmer is able to rent his land to larger farmers, China's organized retail and extensive Chinese highways are able to provide the incentive and infrastructure necessary to its farmers for sharp increases in farm productivity. Adoption of modern agricultural practices and use of technology is inadequate, hampered by ignorance of such practices, high costs and impracticality in the case of small land holdings. According to the World Bank, Indian Branch: Priorities for Agriculture and Rural Development", India's large w:agricultural subsidies are hampering productivity-enhancing investment. Overregulation of agriculture has increased costs, price risks and uncertainty. Government intervenes in labour, land, and credit markets. India has inadequate infrastructure and services. World Bank also says that the allocation of water is inefficient, unsustainable and inequitable. The irrigation infrastructure is deteriorating. The overuse of water is currently being covered by over pumping aquifers, but as these are falling by foot of groundwater each year, this is a limited resource. Illiteracy, general socio-economic backwardness, slow progress in implementing land reforms and inadequate or inefficient finance and marketing services for farm produce. Inconsistent government policy. Agricultural subsidies and taxes often changed without notice for short term political ends. Irrigation facilities are inadequate, as revealed by the fact that only 52.6% of the land was irrigated in 2003–04, which result in farmers still being dependent on rainfall, specifically the Monsoon season. A good monsoon results in a robust growth for the economy as a whole, while a poor monsoon leads to a sluggish growth. Farm credit is regulated by NABARD, which is the statutory apex agent for rural development in the subcontinent. At the same time overpumping made possible by subsidized electric power is leading to an alarming drop in aquifer levels. A third of all food that is produced rots due to inefficient supply chains and the use of the "Walmart model" to improve efficiency is blocked by laws against foreign investment in the retail sector. ^ a b "FAOSTAT: Production-Crops, 2010 data". Food and Agriculture Organization of the United Nations. 2011. http://faostat.fao.org/site/567/DesktopDefault.aspx?PageID=567#ancor. ^ Adam Cagliarini and Anthony Rush (June Quarter, 2011). "Bulletin: Economic Development and Agriculture in India". Reserve Bank of Australia. p. 15-22. http://www.rba.gov.au/publications/bulletin/2011/jun/pdf/bu-0611-3.pdf. ^ "Top Production India: 2009". FAOSTAT, The United Nations. 2009. http://faostat.fao.org/DesktopDefault.aspx?PageID=339&lang=en&country=100. ^ The numbers in this column are India's average, metric tons per hectare per year; regional farm productivity within India varies. For milk and other produce, productivity is on per livestock animal basis. ^ The numbers in this column are country average; regional farm productivity within the most productive country varies, with some farms even higher. ^ "Country Rank in the World, by commodity". Food and Agriculture Organization of the United Nations. 2011. http://faostat.fao.org/DesktopDefault.aspx?PageID=339&lang=en&country=100. ^ a b "Handbook of Statistics on Indian Economy". Reserve Bank of India: India's Central Bank. 2011. http://www.rbi.org.in/scripts/AnnualPublications.aspx?head=Handbook%20of%20Statistics%20on%20Indian%20Economy. ^ Data checks suggest there is difference between FAO's statistics office and Reserve Bank of India estimates; these differences are small, and may be because of the fiscal year start months. ^ Mahadevan, Renuka (December 2003). "PRODUCTIVITY GROWTH IN INDIAN AGRICULTURE: THE ROLE OF GLOBALIZATION AND ECONOMIC REFORM". Asia-Pacific Development Journal 10 (2): 57–72. ^ "Rapid growth of select Asian economies". Food and Agriculture Organization of the United Nations. 2006. ftp://ftp.fao.org/docrep/fao/009/ag087e/ag087e00.pdf. ^ a b "India: Priorities for Agriculture and Rural Development". World Bank. http://web.worldbank.org/WBSITE/EXTERNAL/COUNTRIES/SOUTHASIAEXT/EXTSAREGTOPAGRI/0,,contentMDK:20273764~menuPK:548214~pagePK:34004173~piPK:34003707~theSitePK:452766,00.html. ^ Biello, David (2009-11-11). "Is Northwestern India's Breadbasket Running Out of Water?". Scientificamerican.com. http://www.scientificamerican.com/article.cfm?id=is-india-running-out-of-water. Retrieved 2011-09-17. ^ Multiple authors (2004). Agricultural Statistics at a Glance 2004. http://dacnet.nic.in/eands/4.6(a)All%20lndia%20Area,%20Production%20and%20Yield%20of%20Rice.xls. ^ Sankaran, S. "28". Indian Economy: Problems, Policies and Development. pp. 492–493. ^ "Satellites Unlock Secret To Northern India's Vanishing Water". Sciencedaily.com. 2009-08-19. http://www.sciencedaily.com/releases/2009/08/090812143938.htm. Retrieved 2011-09-17. ^ "Columbia Conference on Water Security in India" (PDF). http://www.water.columbia.edu/sitefiles/file/India%20Conference/India%20Conference.pdf. Retrieved 2011-09-17. ^ Keepers of the spring: reclaiming our water in an age of globalization, By Fred Pearce, page 77. Books.google.com. http://books.google.com/books?id=bI1tBl1IZ98C&pg=PA77&lpg=PA77. Retrieved 2011-09-17. ^ Zakaria, Fareed. "Zakaria: Is India the broken BRIC?" CNN, 21 December 2011. This page was last modified on 18 February 2012, at 14:53.